UGA had a better class than us on paper last year, but there may not be a better player in their whole class than Waddle and Surtain. Sumlin, Malzahn, and even Butch Jones signed some unreal classes that never came close to reaching their potential. Saban's ability to sign, manage, and maximize top classes is what sets him apart. Kirby may end up being able to do the same thing, but so far he hasn't proved that yet. This from ESPN website is curious. 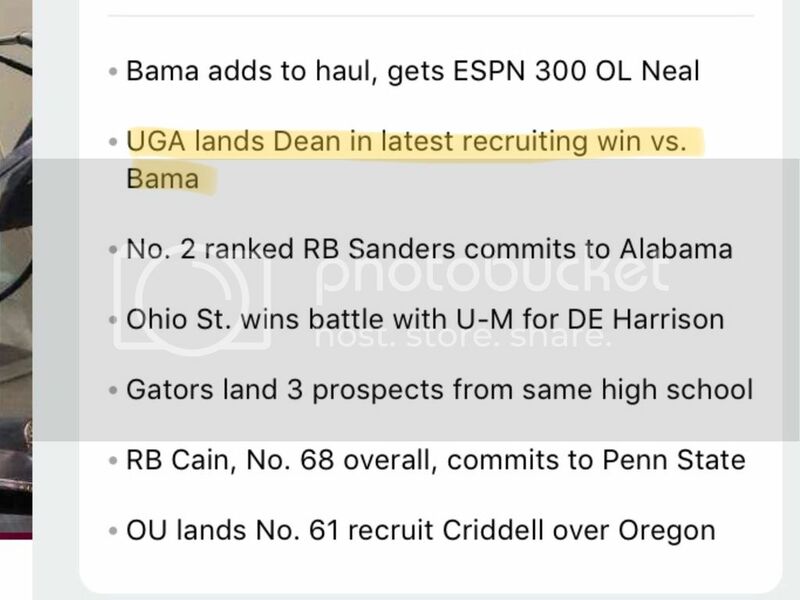 Why mention UGA in latest win vs Bama with Dean, but not mention anything about UGA Losing out to Bama with the prospects above and below, Sanders and Neal? Kirby’s crown jewel in that class was Fields, and he is leaving. Probably Luke Ford as well. Also, in our class from last year, You left out Anoma, who will be a beast. A beast A BEAST! Last edited by bamaga; December 20th, 2018 at 04:39 PM. Oh I agree, I'm just making the point that we already know we have a lock down corner and a WR that is among the best in the country ALREADY along with being a dangerous return man. Anoma, Davis, Wynn, Jobe, and Kaho are all most likely going to be studs from the class, but Waddle and Surtain are at least All SEC caliber players today. ...we have a crazy reach nationally. Hope we pickup another good coach/recruiter for DC/Maryland. That area has been good to us! Posted this in another thread. Applicable here also.. Pretty stunning that we have roughly twice as many ESPN 300 recruits as AU and A&M and a really wide gap between us and LSU. UGA is the only team in our class talent wise.. In a possible answer to your question I believe some of the ranking services only evaluate the top "X" number of signees to help compare classes of different sizes. Bama signed only 23 not 26. The guys with no rating are JC players. As far as recruiting rankings go, both teams will be signing a few more in February but Georgia would have to really blow it out the water then to catch us, but as you said it really does not matter. They were the number one class last year and Mr. five Star Fields was the top signee in the class and now he is transferring so how does that #1 ranking look now? What really matters is how this class still looks three to four years from now. Look then and see what they have accomplished and then rank them based on that you will get a lot better result. I absolutely agree with your statement I highlighted above. We all can point to 5* busts, as well as 3*'s that excel. Deondre Baker the 2018 Thorpe Award winner for the best DB in the country was a 3* coming out of HS. Good coaching has made him significantly better than when he arrived in Athens. I think too much is made of player ratings, but I understand why we as recruitniks pay attention to them. Agreed as well. Signing them is great, but managing 5 star egos, and breaking bad habits of a lot of kids that have been by far the best athlete on the field their whole life cannot be understated. Finding diamonds in the rough is part of it too. All that said, signing a bunch of 4 and 5 star guys doesn't guarantee anything, but it greatly increases the chances of being a great team. Even if UGA beats us in the recruiting numbers, we already won. This recruiting class we just got is loaded in the trenches on both sides of the ball. Ole Nick and company sure did get back to the basics with this class. The OL class we are getting maybe the best OL class we have had under Nick and Trey Sanders maybe the best RB we have had under Nick as well. That guy has Saquon Barkley written all over him. And don't sleep on this incoming DL class either. They are going to be some terrorizers. Didn’t we have the same last cycle?